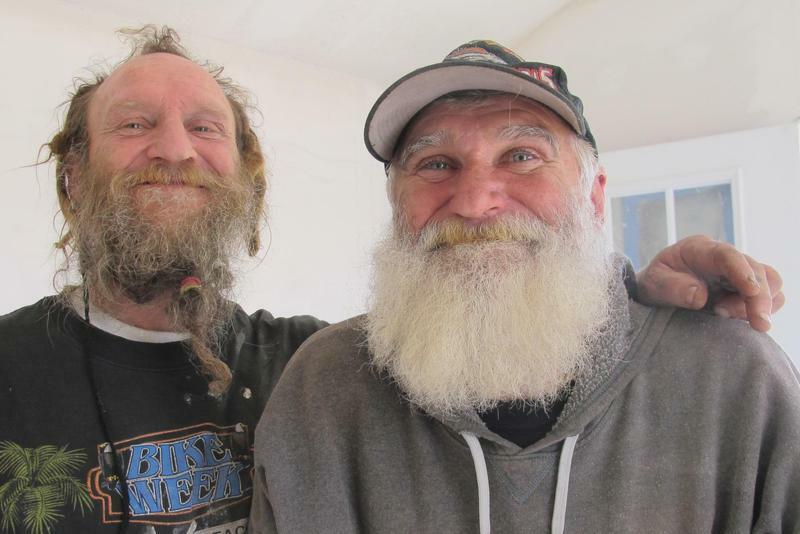 The homeless Army veteran who inspired the Veterans Community Project, White Hawk (right), with his friend Jerry. Jamison, along with his partners in the Veterans Community Project, paid $500 for this land. They bought it from the City Land Bank, and plan to fill it with 45 or 50 little tiny houses. That’s right. Tiny houses — miniature homes with all the regular house stuff compressed into maybe a third or a quarter the size of a big suburban living room. 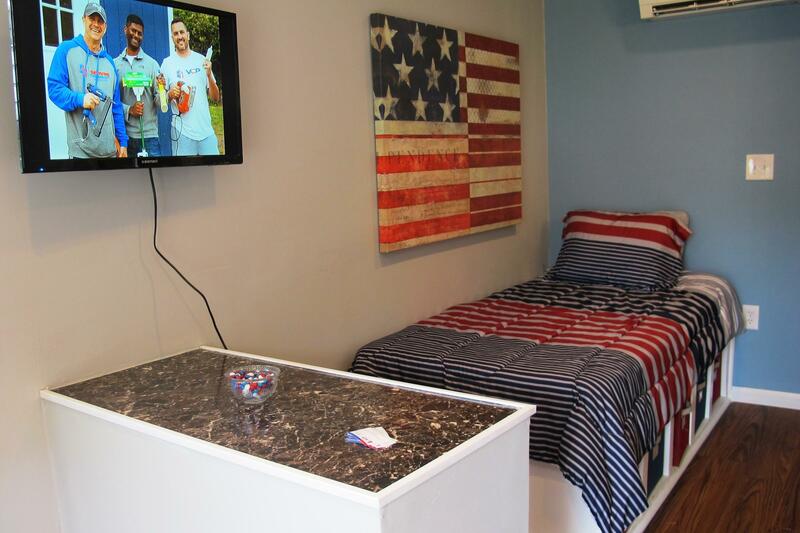 The Veterans Community Project intends to make the tiny houses available, for free, to homeless veterans. So far, there’s one: a simple blue place. It looks like a big garden shed from the outside but seems very homey when you step inside. 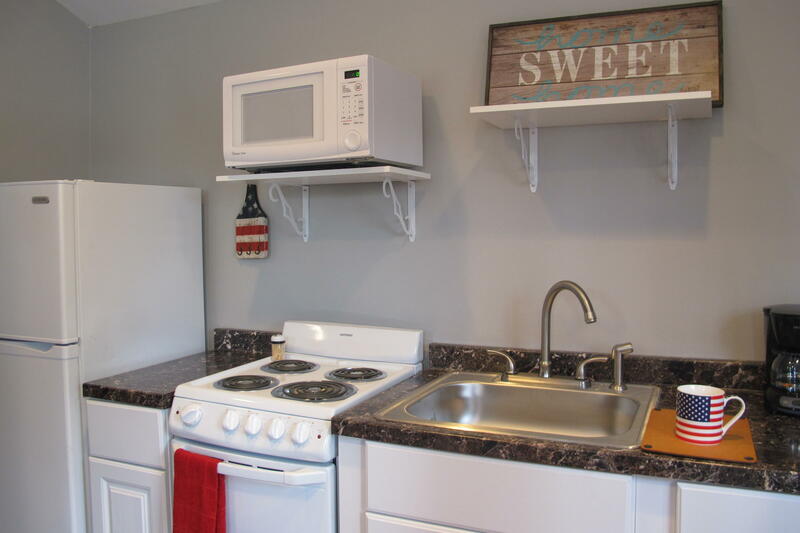 The kitchen inside the first tiny house at the Veterans Village land at 89th and Troost in Kansas City. Jamison was in the Marine Corps. 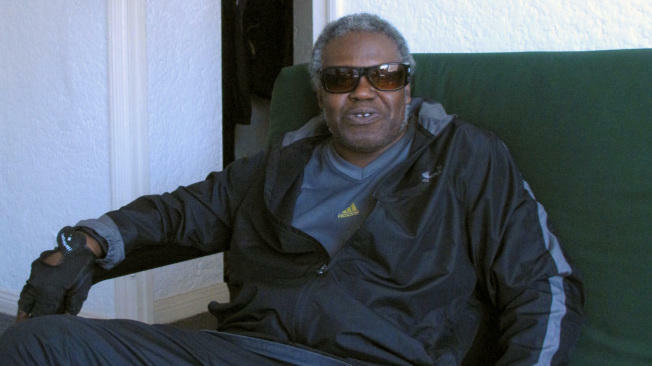 Working with homeless veterans the last couple of years, he noticed that homeless shelters weren’t working for everybody. In fact, there was one guy in particular. “We designed this program for guys like White Hawk,” Jamison says. White Hawk is a street name. The man using it gets around on crutches. He’s got a bushy white beard and blue-gray eyes. He says he served in the Army in West Germany during the Cold War. White Hawk says he’s has been homeless since 2009, when he got out of prison. He says the felony on his record makes it hard to get a job, but he’d be a great candidate for a spot in a homeless shelter ... except for a couple of things. For one, he’s not alone. Homeless shelters typically forbid dogs or cats, let alone a room full of them. Lots of homeless veterans have pets and are fiercely devoted to them, so a pet ban creates a real hardship for many. The other thing about White Hawk, and perhaps others in his situation, is that he just doesn’t mind much being homeless. At this point, Jerry, White Hawk’s friend, here with him to look at the tiny house, chimes in. “Society has rules. And we like to be free,” says Jerry. Jerry has been living in the camp near White Hawk for years, away from the tension of homeless shelters, or broader societal expectations. The fact that some vets would rather be homeless than live in a shelter comes as no shock to Chris Stout. Stout, an Army vet, also works professionally with the homeless, and was Jamison’s first partner in the project. And Stout says pets will absolutely be allowed in the tiny houses. After all, he says, if one of them gets completely trashed, they can replace it for less than $10,000. Living in the houses will also be free, even if the veteran has some income. A view inside the house at Veterans Village. Veterans Community Project founders, Kevin Jamison, retired Marine Corps, Navy reservist Mark Solomon, and Army vet Chris Stout are shown on the TV. Stout, Jamison and their other partner, Navy reservist Mark Solomon, credit Kansas City Councilwoman Teresa Loar with coming up with the idea to use tiny houses instead of trying to build a traditional homeless shelter. She says it was an informal suggestion. “I just discussed it one evening with the boys over a couple of beers, actually,” Loar says. Private-sector citizens and organizations have put up all the money for the project so far, with the United Auto Workers donating the most. But the city has a role. In addition to help getting permits and a deal on the land, it’s going to have to plumb the site with water and sewer pipes to accommodate up to 50 tiny houses. Lore says if this Veterans Village development works in Kansas City, it may be a national model. “We went to a lot of veterans’ organizations in Washington D.C., and they are watching to see if this works. So we are in fact on the cutting edge here, almost a pilot program to see if this works out,” Loar says. U.S. Rep. Emanuel Cleaver is already on board. Cleaver sits on a House subcommittee on housing and insurance. He says he intends to get, the secretaries of both the Veterans Administration and Housing and Urban Development to come take a look at what’s going on in Kansas City. 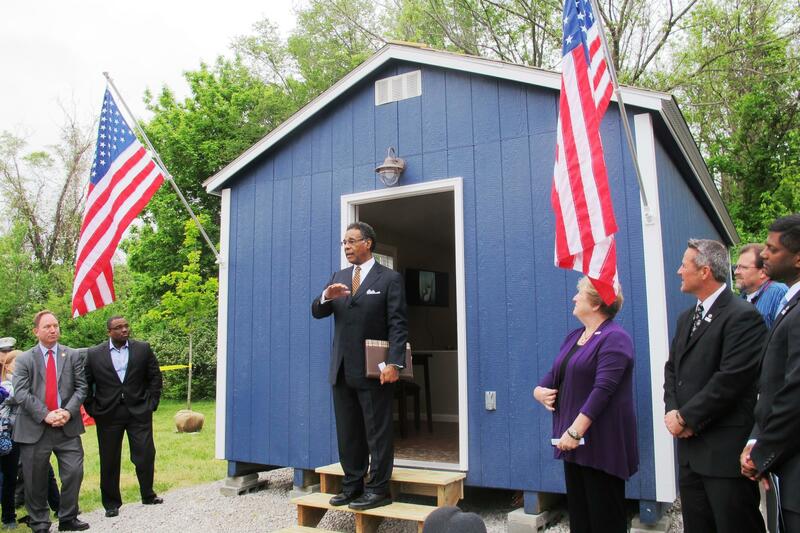 Congressman Emanuel Cleaver, attending a ribbon-cutting ceremony this week for the Veterans Village, sees a larger role for the federal government in funding the project. But, no one can force veterans to take advantage of the tiny houses, and White Hawk is still making up his mind. “Well, I’ll have to ... give it some thought,” he muses. Jamison, Stout and Solomon don’t think every homeless veteran is going to be so hard to convince. They intend to have people living in furnished tiny houses in their Veterans Village, with AC, heat and running water, by the end of the summer.